Crowley Maritime Corporation recently participated as one of several Gas Technology Institute (GTI) funding collaborators to bring liquefied natural gas (LNG) awareness training to 150 stakeholders and first responders in Jacksonville. 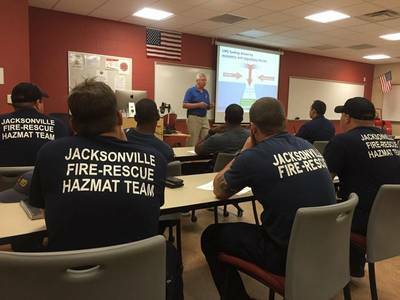 GTI, in conjunction with the Florida State College at Jacksonville Fire Academy of the South (FAS), developed the first-of-its-kind training specifically for Port of Jacksonville area stakeholders including Jacksonville Fire and Rescue Departments, U.S. Coast Guard Sector Jacksonville and area law enforcement. The Jacksonville Marine Transportation Exchange (JMTX) – the maritime trade organization that coordinates the safe, secure and environmentally responsible management of the marine transportation system within the Port of Jacksonville – worked closely with U.S. Coast Guard Sector Jacksonville to seek out potential members of the funding collaborative and garner support from representatives of the local Area Contingency Planning (ACP) community. 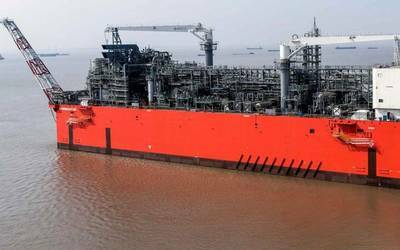 Since Crowley currently supplies LNG to Puerto Rico via barge and will take delivery of two container – Roll-On/Roll-Off (ConRo) ships in 2017, the company was proactive in participating in this training endeavor. Training attendees were introduced to the basic characteristics and properties of LNG, its usefulness as a fuel, its hazards and safety precautions to take when working around the product. The group also learned basic and advanced firefighting techniques including identification of ignition sources, and what types of extinguishing agents exist and when to use them in varying situations. Upon completion, attendees satisfied basic LNG awareness as defined by the U.S. Coast Guard’s Standards of Training, Certification, and Watchkeeping (STCW). “The goal of this training is to keep the excellent safety record maintained by the marine transport of LNG in the past and apply it to the safe bunkering process as we fuel new LNG fueled vessels into the future,” said Mark Marien, Crowley’s manager, regulatory training.